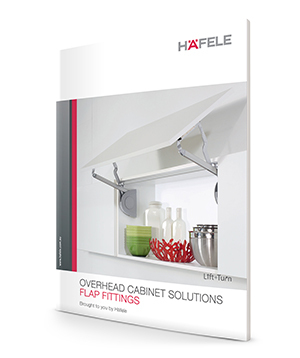 Free Flap is a hingeless stay flap fitting for all of the most common cabinet heights and flap weight combinations. The Free Flap stay flap fitting is in touch with the latest trends with regard to compactness and design. The fittings impress with their ease of operation. During development, Häfele placed a considerable amount of importance on having a slimline and minimalist design in order to create more space in the cabinet, and having an attractive appearance as a result. Many different flap sizes in kitchens, bathrooms, offices and living areas can be equipped with Free flap. Another advantage of this flap fitting is its unique, minimal opening resistance. Thanks to the multi-position function, which can be perfectly adjusted using the force adjusting facility, Free flap holds the flap in every position. The integrated finely-tuned soft closing system provides operating convenience.